Jalna, Jan 28: Breaking silence over the alleged seat-sharing formula between BJP and Shiv Sena, Maharashtra BJP Chief Raosaheb Danve said that BJP is favor of pre-poll alliance but reports quoting 24-24 seat sharing formula are untrue and baseless. 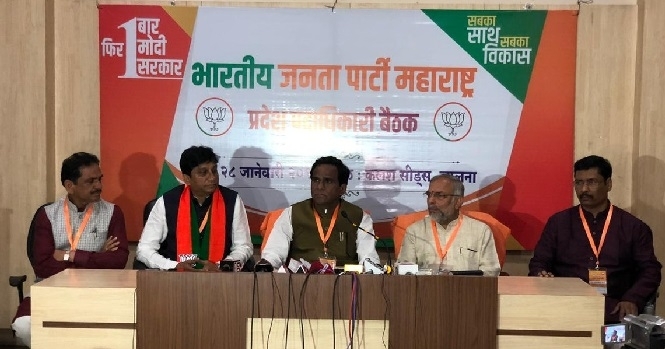 Speaking to the media on the backdrop of Maharashtra BJP’s crucial State Office Bearers’ Meeting in Jalna, the Lok Sabha MP clarified that BJP will take the final call on the proposed pre-poll pact. Maharashtra Chief Minister Devendra Fadnavis today inaugurated the day long organizational meeting where all the Ministers and senior BJP leaders across the state will deliberate on the upcoming Lok Sabha Polls. Speculations were rife over the alleged seat-sharing formula of 24-24 for the 48 Lok Sabha segments in Maharashtra, the biggest state after Uttar Pradesh. On the other hand, ahead of the Lok Sabha polls, Shiv Sena Chief Uddhav Thackeray also chaired a crucial internal meeting with Shiv Sena Lawmakers. In 2014, under the leadership of Devendra Fadnavis, then state BJP head, BJP bagged 23 seats where ally Shiv Sena ended up with 18 Lok Sabha segments. During Maharashtra state assembly election, both parties parted away and fought separately. In 2014 Maharashtra assembly polls, with 122 segments, BJP emerged as the single largest party and formed first BJP government in the state. Shiv Sena bagged 63 seats.